A Thing for Roses: Good Times! We had another fun filled last-days-of-summer-break day yesterday. 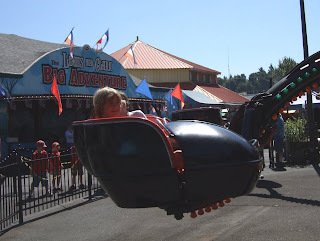 Told the kids they could each take a friend to Oaks Park, an amusement park on the banks of the Willamette River in Portland, OR. We had a great time despite the heat. Only managed to get a couple shots of them, of course couldn't get any pictures of them together. This year I have two middle-schoolers which will be really nice for drop offs. They have mixed feeling about starting another school year. We have had a great and fun summer and I know personally, I am ready for school to start. Look what I got in the mail when I came home! 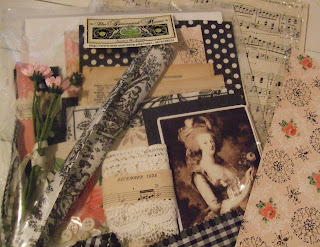 This is the french collage pack I ordered from The Decorated House. I just love how it arrived. Almost too pretty to open up. I already have big plans for this great stuff. To start, I think I will make a journal/scrapbook for myself to finally organize all my stuff from the trip I took to Paris last year. Don't you think it will be cute? I have never really done any collaging, (is that even a word?) but I have been wanting to try it and now that I have all the goods I need to get started, I should just...get started. ha ha I think if I have good luck with the journal, I may even tackle a french themed tool box. Cool, can't wait! Isabel and I are headed over to Monticello today for a little updating and refreshing of our booth. Out with the old, in with the new (old stuff). It will feel so good to get that done. There is another antique show coming up in September in Troutdale (not too far away) and we are both trying to figure out if we should do it. We have so much stuff, it is a little overwhelming and of course, we just keep buying more. It's a sickness, I know. Tomorrow, hubby, the kids and I are going to the coast for a little fun in the sun and on the water. We are taking the boat out to do a little crabbing which we have wanted to do for awhile. It is just one more fun thing we are trying to pack in before school starts. Hopefully we will have some nice weather over there. Wish us luck! Have a great weekend. I wish you were coming to Newport. Talk to you when I get back. I love your new prize in the mail.. Did I see orange??? I can't wait to see what you do with all your goodies! I'm sure you will have lots of fun with it. It was so much fun reading back over some of your posts. I adore your shopping cart! So cute. Looks like you all had a great time today. 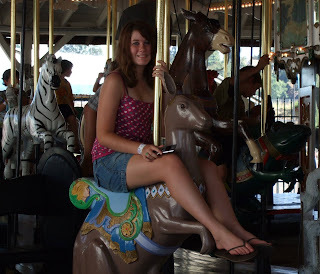 I love carousels! You just can't outgrown them now can you! Thanks so much for stopping by my site.